My nightly routine of editing, lathering my face in hydrating masks, picking up my room that has been caressed by a hurricane and fails to stay tidy has been momentarily paused when G pulls out my favorite (and discontinued) bottle of wine for a date night; I know something is up. For years, I have been scrambling to work, work, work! Getting the most amount of things done possible in one day, and doing it well. I would wake up and immediately become so excited that I would overwork myself to sickness, forcing me to lay down. All of this exhausting behavior has led me to finally understand the legendary quote by the work simplification icon, Allan Mogensen, "Work smarter, not harder." So, by simply changing my swing of everyday life, I have begun to understand the little moments, the quiet moments with yourself and family, are the ones to remember. Climbing the long flight of steps into Paint & Sip LA made me immediately strip the overworking thoughts about tomorrow, the photos that need edited and the room that has got to be picked up. They pride themselves in keeping a fun atmosphere, stress free and to release all of the negativity or added up emotions from a long work day. 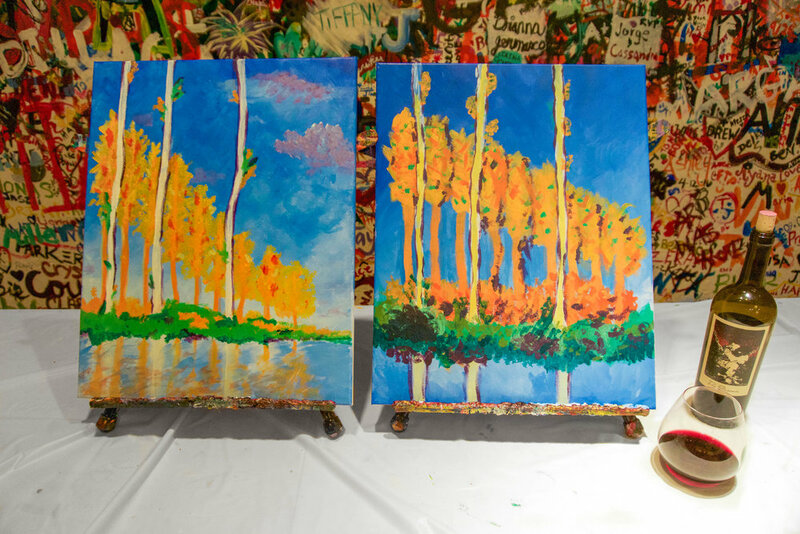 Instead, whip out your favorite glass of wine, pick up a paint brush, and let go. Our lead instructor, Tamara, invited us into her intimidating room of beautifully created masterpieces. All of us, the painter amateurs, looked dumbfounded as she effortlessly led us through a very complicated painting, but she didn't let us become overwhelmed. From the second she began class, her introduction was something like this. "Ok guys, I know what you're thinking. HOW am I possibly going to create this painting? I know that most of you haven't picked up a paintbrush since elementary school, and you probably don't remember much. But this space is for releasing, enjoyment and creativity. I am not your teacher, and you are not my students. I am not grading you, and I will not judge you when things aren't perfect. In fact, I don't want your painting to be perfect! You can follow instructions, or you can just draw whatever you want! I am here to encourage you, and to help you the second you feel stress. Have fun with it, and have another glass!" The room immediately let out of sigh of relief, and I have to admit I did too. I realized, this isn't a test and nobody is here to tell me I am doing it wrong, just like life. It's my painting[my life], and I'm going to streak colors back and forth in an "x" motion to create a masterpiece I am proud of. 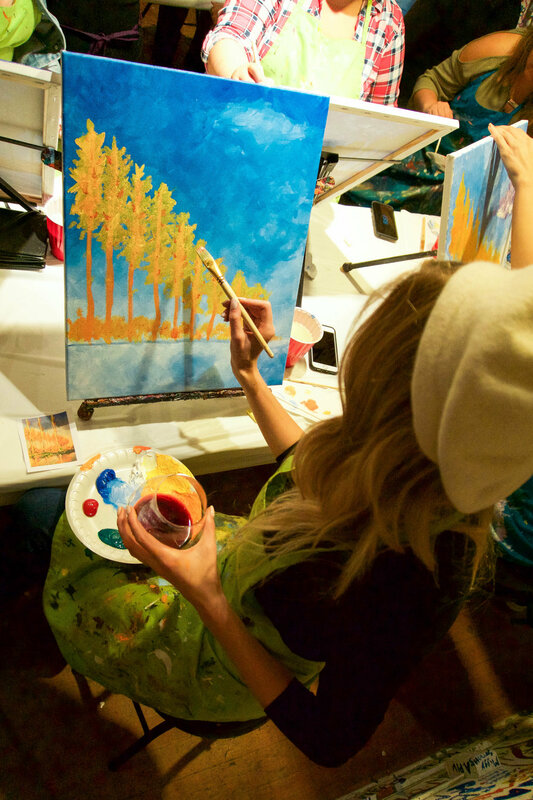 Interested in Paint & Sip? Click here to check their upcoming schedule, and don't forget to let them know Liberty sent you!